Want a fun way to liven up your bathroom? 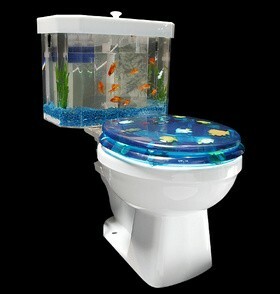 How about an aquarium toilet tank to keep your fishy friends in. Yes…I said an AQUARIUM TOILET TANK. This is The Fun Times Guide to Homebuilding you know. Care to take a look at an underwater adventure you won’t soon forget? Just think…a goldfish’s worst nightmare at the touch of a finger…but it’s all an illusion. Sorry…that’s not my intention here. This is truly an item that is a conversation piece, as well as a functioning aquarium and toilet all-in-one. It’s a two-piece aquarium toilet tank that fits most two-piece toilets. An aquarium toilet tank is truly for the person who has everything and enjoys viewing fish throughout their home including the bathroom. What will they think of next??!! I’d be willing to wager that kids would love it. You’ll need to keep an eye on the little ones, though. They might get the idea to…well…you know. The Fish ‘n Flush is made by AquaOne Technologies. The Fish ‘n Flush was featured on the April 21, 2006 CBS “Early Show” while premiering at the 2006 Kitchen and Bath Industry Show and aired on HGTV recently. How much does the Fish ‘n Flush cost? $351.50 S&H included; LED kit included. Price may vary but that’s the published price when I checked today. Oh yeah…I almost forgot. They also have the “Santa and his tiny reindeer” toilet tank available (see below). The Moody Aquarium Sink; an Even Design by Italbrass: Here’s a video of the aquarium sink that would liven up any lavatory. The Aquariass Aquarium Toilet offered by Elseware Inc.